At The Lodge at Breckenridge, we specialize in creating meaningful and lasting memories while you visit the Rocky Mountains. Each of our 45 guestrooms has a unique layout and customized features to make each and every stay exceptional. If you need canine-friendly accommodations or want to make a special room request, such as adjoining rooms, private balcony, in-room fireplace, or sleeper sofa, please give us a call at 1-800-736-1607 to ensure it is pre-arranged prior to your arrival and your request is noted in your reservation. 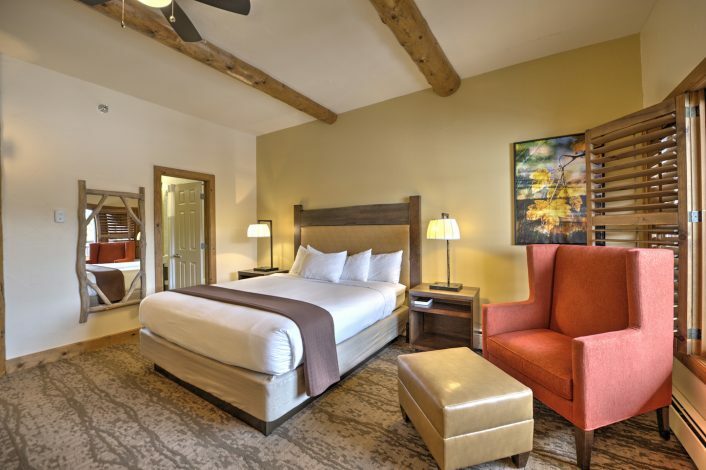 Find perfect comfort in our Lodge King Room with one king bed, beautifully trimmed with rustic log beam accents. Complete with in-room Keurig coffee, mini-fridge, eco-friendly amenities, flat screen TV, humidifier, portable fan, and premium cable, you will find your mountain tranquility while you relish in the adventure surrounding you in Breckenridge. 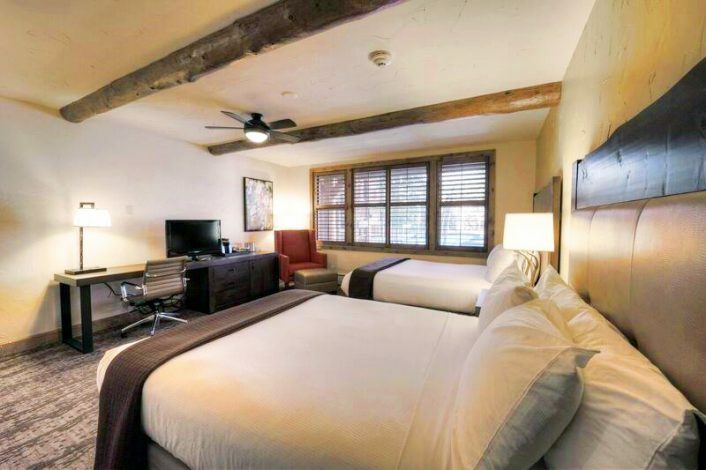 Feel right at home in our Lodge Room with two queen beds - beautifully trimmed with rustic log beam accents and perfect for accommodating up to four adults. Our lodge double queen is complete with in-room Keurig coffee, mini-fridge, eco-friendly amenities, flatscreen TV, humidifier, portable fan, and premium cable; you will find your mountain tranquility to recharge between your mountain adventures. 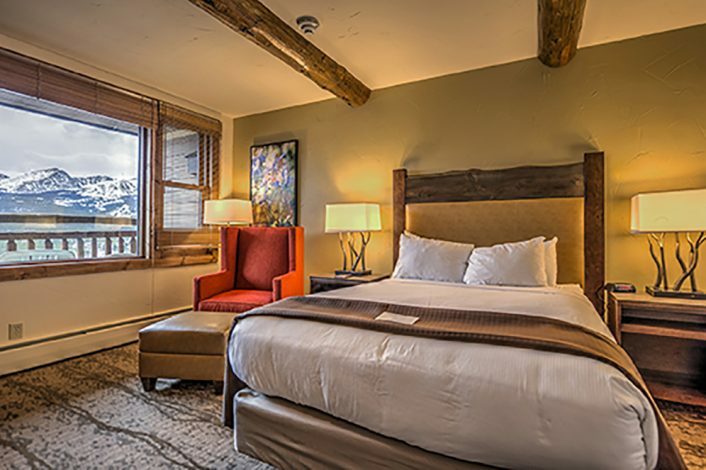 There is no better way to enjoy Breckenridge than in our Mountain View Room with one king bed boasting spectacular views of the Colorado Rocky Mountains. Kick back in the large sitting area and relax by your in-room fireplace while you prepare for your next adventure. Each room features in-room Keurig coffee, mini-fridge, eco-friendly amenities, sleeper sofa, flatscreen TV, humidifier, portable fan, and premium cable. 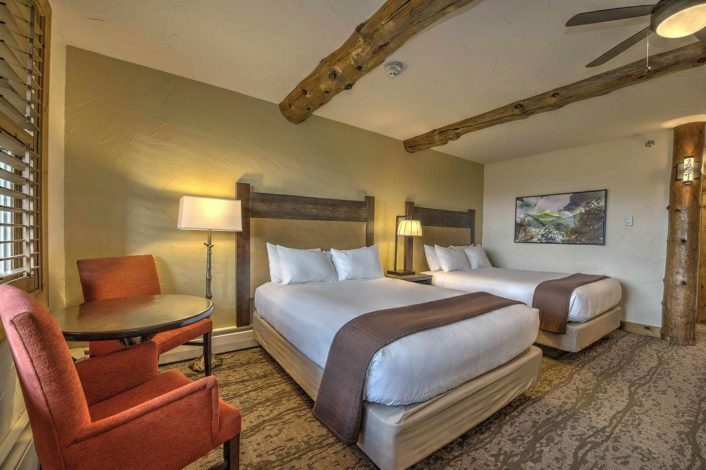 A restful night's sleep awaits you in our Mountain View Room with two queen beds - beautifully trimmed with rustic log beam accents and spectacular views of the Colorado Rocky Mountains. Relax and enjoy in-room Keurig coffee, mini-fridge, eco-friendly amenities, flatscreen TV, humidifier, portable fan, and premium cable as you prepare for your next Rocky Mountain foray. 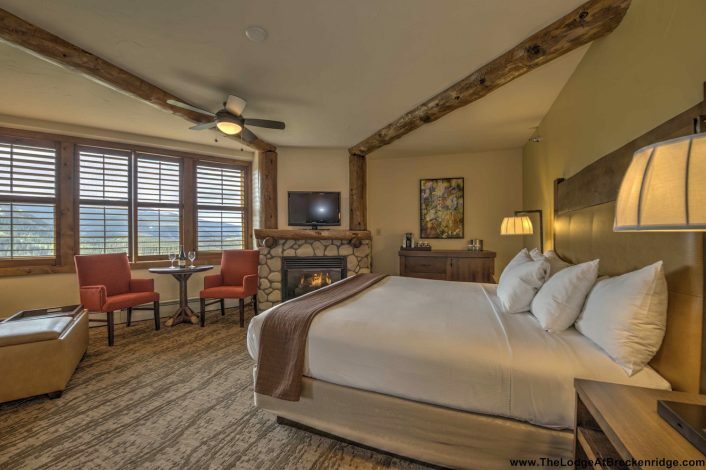 With panoramic views overlooking Breckenridge Ski Resort, our luxurious suites envelope you in a cozy sitting area by the fireplace and feature a discreet kitchenette. Offering ample space to kick up your feet and warm your toes, our suites are perfect for a longer stay or families looking for that 'something extra.' Each suite is complete with in-room Keurig coffee, mini-fridge, eco-friendly amenities, flatscreen TV, humidifier, portable fan, and premium cable. Need some extra space to spread your things? Most suites connect to a Mountain View room. One king bed and sleeper sofa. 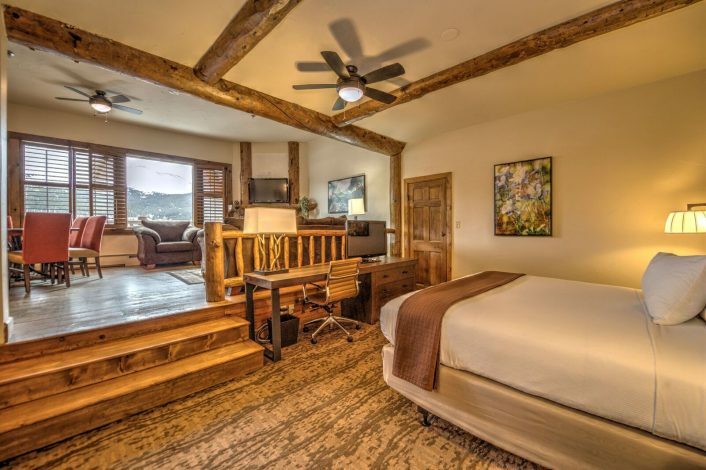 This room meets the standards of the ADA - With one queen bed, this room is beautifully trimmed with rustic log beam accents and spectacular views overlooking Breckenridge Ski Resort. 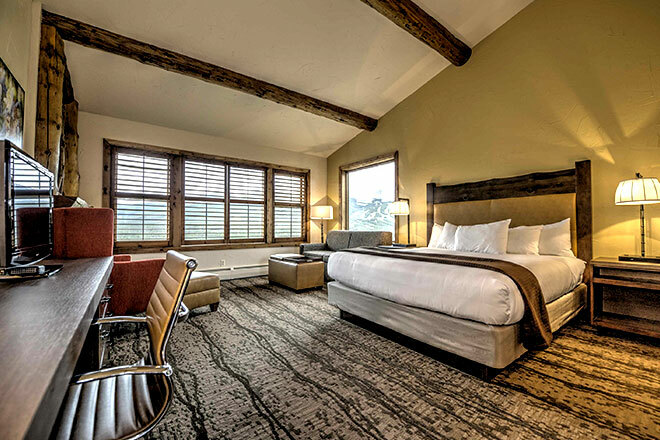 Relax and enjoy in-room Keurig coffee, mini-fridge, eco-friendly amenities, flatscreen TV, humidifier, portable fan, and premium cable as you prepare for your next Rocky Mountain foray. This room also has a balcony and extra large bathroom. The Sunlight Peak Suite is a one of a kind extra-large accommodation with one king bed and a twin size sleeper sofa featuring stunning views of the Rocky Mountains, balcony, gas fireplace, small kitchenette (including dishes and utensils) with a full-size refrigerator and microwave, separate dining & sitting area, flat screen TV, ceiling fan, humidifier, portable fan and a Keurig coffeemaker.